Last year was a record-breaking year for customer service at iiNet, and after winning our first international award for customer service excellence from the International Council of Customer Service Organisations, I’m thrilled to see 2014 is already shaping up to be an even better year for us and our customers. 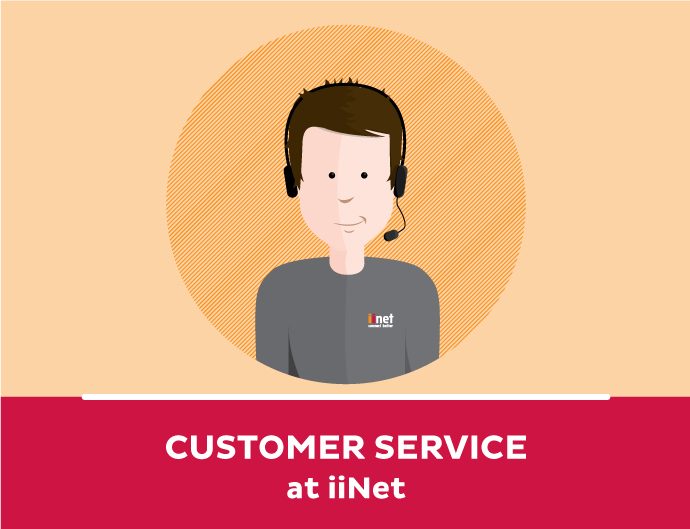 It’s no secret that at iiNet we pride ourselves on delivering exceptional customer service and being open and honest in our dealings with customers. So, as part of my commitment to constant improvement of service, each quarter I will be writing about how we’re faring in the eyes of our customers and sharing insights and experiences from our customer service team. Let’s start with the stats: iiNet finished off 2013 with a record-high customer service ranking, measured using the global-standard Net Promoter Score (NPS), and is set for another record-breaking year of customer service. In the first half of 2013, iiNet achieved a company NPS of 56.7 per cent, our best performance to date and, we believe, the only positive score in the Australian telecommunications industry. After celebrating our success, I set the bar even higher, challenging staff to work towards a minimum of 58 per cent for the second half. At the end of the last quarter, iiNet recorded an NPS of 59 per cent, which finished the year on a high and put the company on track for another year of delivering exceptional customer service. Have a look at our infographic below for a snapshot of our performance over the years. We’re aiming for an NPS of 60 per cent for the first half of this year, which will require a big step up for our customer service staff. Typically, summer is our busiest time of year for the contact centre with wild weather, including bushfires and heat waves, contributing to a higher number of calls, leading to longer queues which impacts our NPS. Our survey results tend to be lower in the first quarter compared to the rest of the year, so it’s going to require a dedicated effort from everyone. NPS is a performance metric that measures how customers rate service. It’s a simple survey sent to every customer after any interaction with iiNet to measure whether that customer would recommend iiNet to a friend. NPS is a scale from minus 100 per cent to plus 100 per cent. In broad terms, a negative score means that customers aren’t very enthusiastic about the company while a positive score means that customers are more likely to recommend that brand to friends. We introduced NPS to iiNet in 2007 to give staff a tangible way to demonstrate their ability to deliver exceptional service to their customers and help identify areas where they could improve. Since its introduction I am pleased to say that our company NPS has only improved, and I am proud of how every member of staff is so dedicated to working towards constantly increase customer satisfaction. Without happy customers we have nothing, and I am pleased to say that everyone at iiNet understands this and is focused on doing their part to keep our customers satisfied and ensure our culture of service continues to thrive as the company grows. We know that from time to time our customers aren’t going to be satisfied. There will be times the Internet goes down in our neighbourhood or frustration with those technical problems as our homes become more sophisticated. There will always be difficult calls, but what sets us apart is our commitment to improving and our culture of open, honest feedback. But don’t just take my word for it, checkout what two stars of our call centre Steve Jarrett and Timothy Mayers have to say about working for iiNet and how exceptional customer service is part of everything they do. iiNet has grown to a value of approximately $1 billion with close to one million broadband customers – the clear number two DSL broadband provider in Australia – with services now extending across telephony, television and mobile. At iiNet we are determined to do business in the ISP space differently; 80 per cent of our staff are in customer service roles and we invest heavily in those people. From day one, we encourage our staff to use their discretion and judgement in helping customers solve problems. This focus on service is what makes the difference in our NPS, we started with a small positive score in 2007, but we’ve seen our NPS grow from there as we really got everybody focused on the feedback from customers. It’s taken a massive commitment but I’m so proud of the way it has allowed everybody to get behind a common goal. Please find out what’s happening with your customers. I am a victim of worst customer service and will try my best to get justice. Thank you for bringing this to our attention, I will be looking into this task on Maryna’s behalf and will be organising a call from a manager as per our escalations process to discuss these matters with you. Didn’t Westnet consistently get NPS scores in the 70s and 80s? Until you ii’d them that is. I’m a new customer of iiNet & Very Happy !! The support is Fantastic !!! What happened to the call back facility on the customer support? This was a great service which left Telstra for dead. Unfortunately it seem iinet have taken a step backwards by taking a leaf out of the Telstra Customer Service leaving people waiting on a phone line listening to the same blah blah blah over and over again. We still have our call back feature (virtual hold) however, during busy periods, all the call back spots can be filled up rather quickly. Rather than slot everyone in and potentially have the system call you back after 12am, we turn the feature off until we are back to a reasonable time frame. We are currently in the busiest time of year for us and we are doing all we can to bring these calls down and keep our customers happy. If you would like to keep up to date with our current wait times, you can check it out on the iiNet Contact page. I find the statistics hard to believe given that I am continually experiencing long delays and having to wait up to 1 Hour plus to get a call back when I have a problem. I also find that it is the luck of the draw with customer service it depends on experience of the call centre person taking the call and can be very frustrating. This is certainly not the customer service impression we wish to give. We are passionate about everything we do and customer service is our driving force. We are in a notoriously busy time of the year currently and we are doing all we can to bring down the high call volumes. Including, but not limited to, pushing a massive recruitment drive for more skilled call taking staff, offering non-call taking staff overtime to assist with the queues and bringing on more sites earlier to take on the busy times of day. This is in no way an excuse for the experience we’ve given you, but I do hope it explains a little about the way we like to help out our customers. Have your concerns been assisted to now or do you still require some help? Sorry to hear about the delay in having you connected. It sounds like we may be waiting for port availability. Have you spoken with our Provisioning Team on 1300 634 515 about the order? They can usually shed some insight into what is causing the hold up. Could iinet please have yr IT Dept. look into “adobe flash”? It cause Apple iOS users to be left “in the dark” regarding some iinet information.